SOUNDCITIES THE GLOBAL SOUNDMAP PROJECT......[version 2]. Released 11.09.2004. 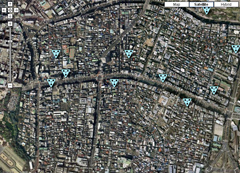 An online open source database of city sounds from around the world, that can be listened to, used in performances on laptops, or played on mobiles via wireless networks. Initially all sounds by Stanza you can now contribute your own found sounds.SOUNDCITIES THE GLOBAL SOUNDMAP PROJECT. 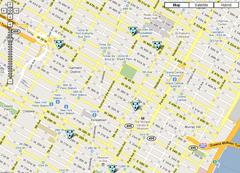 THE WORLDS FIRST ONLINE DATABASE OF CITY SOUNDS AND SOUNDMAPS. READ THIS FIRST UPLOADING SOUNDS TO SOUNDCITIES MAP. 1. If you create a new city, please add more than one sound to this city. It stops there being loads of cities with just one sound. I know it all takes time but for every new city please add minimum five sounds. I appreciate this. 2. Just label the city with one name for example: New York or Paris. 3. Prepare your sound as mp3s. A In bottom right of the map map it says "add a new sound "....click this. B Are you previously registered ie returning user. If so scroll down and get you user name. C Then click the city. F Then choose mood from the pull down, ie traffic or vocals etc. Some people have a problem moving the sound to the correct place. First drag the triangle and if it doesn't end up where you want it to be click the X in the window that surrounds the sound. This will allow you to keep moving it, and you can also zoom in and out on the map. You can keep moving the sound until you are happy. B Have you added a sound here before? Go to NO and add you name and email. Your name will appear. Next follow these steps below. C Which City or create new city (remember just the city name please) OR if you are adding to a city that is already there just go to that city. D Add description. Add description. Keep it simple. Do NOT use odd characters like <> $ @ etc & ......... Drag The city to the correct place. F Choose Mood. Then choose mood from the pull down, ie traffic or vocals etc . H Move sounds on map to correct position by clicking on your sound (the red triangle) and moving it to where it was recorded or until you are happy with the position it is now in. Please repeat and add more sounds, thanks. Sometimes people have a problem moving the sounds to the correct place. First drag the triangle and if it doesn't end up where you want it to be click the X in the window that surrounds the sound. This will allow you to keep moving it, and you can also zoom in and out on the map. You can keep moving the sound until you are happy. IF YOU ADD A NEW CITY IT WILL APPPEAR ON THE MAP AS A RED TRIANGLE. DRAG THIS TRIANGLE TO ITS CORRECT LOCATION . SOUNDCITIES THE GLOBAL SOUNDMAP PROJECT. 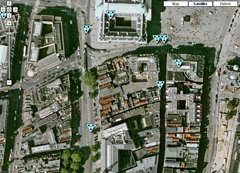 THE WORLDS FIRST ONLINE DATABASE OF CITY SOUNDS AND SOUNDMAPS.